After their earlier swap, the Queensland clubs have taken a bet on each other’s 2019 season, but the Suns have already given up more than they’re likely to get back even if the Lions’ widely assumed revival isn’t forthcoming next season. 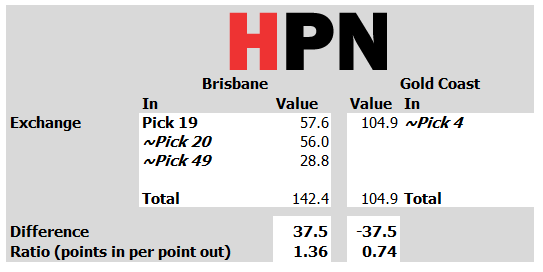 If the Lions finish 15th again and the Suns 17th, the swap becomes pick 4 for 19, 20 and 49, which is on the fringes of a pick-splitting swap a club might consider doing depending on how it rated the draft classes. It’s also the sort of deal we think list managers should consider making more often despite the controversy that would be involved. The high pick is a valuable piece even if it slides, but the Lions haven’t exactly vacated the 2019 draft either, since they’ll hold extra picks in rounds 2 and 3 and may well have academy bidding to consider. They’ve also done this with an eye on the imminent Lachie Neale trade. For the Suns, they are now positioned strongly in next year’s draft and still have picks 2, 3, 24 and 29 this year, so may not have rated the fifth top 30 pick as highly as another club might have.